Last winter I purchased two hellebores. One survived, the other didn't. This year the blooms came early, delicately colouring my winter garden. Delicate pink with yellow interiors, marvelously made. Last January I set myself a challenge. I was very quiet about it as is my wont when I'm unsure that I'll be able to carry through. The challenge: no purchased clothing. Everything, other than underwear and socks, was to be stitched by yours truly. I bought a new bathing suit before the challenge because I wasn't about to tackle THAT! January came and went - I created a travel wardrobe for our trip to Mexico that worked well. The week after our return I began subbing for a week, then two weeks, then a couple of months. The sewing fell off sharply. I stitched furiously in May and created a summer wardrobe that served me well (added to the Mexico items). Summer was very busy and I didn't get nearly as much accomplished as I'd hoped. Then I began teaching in the fall. I've managed to finish just one jacket for myself and a few other small projects for others. I ended up buying two pairs of pants, a t-shirt, a cardigan and a wool winter coat. 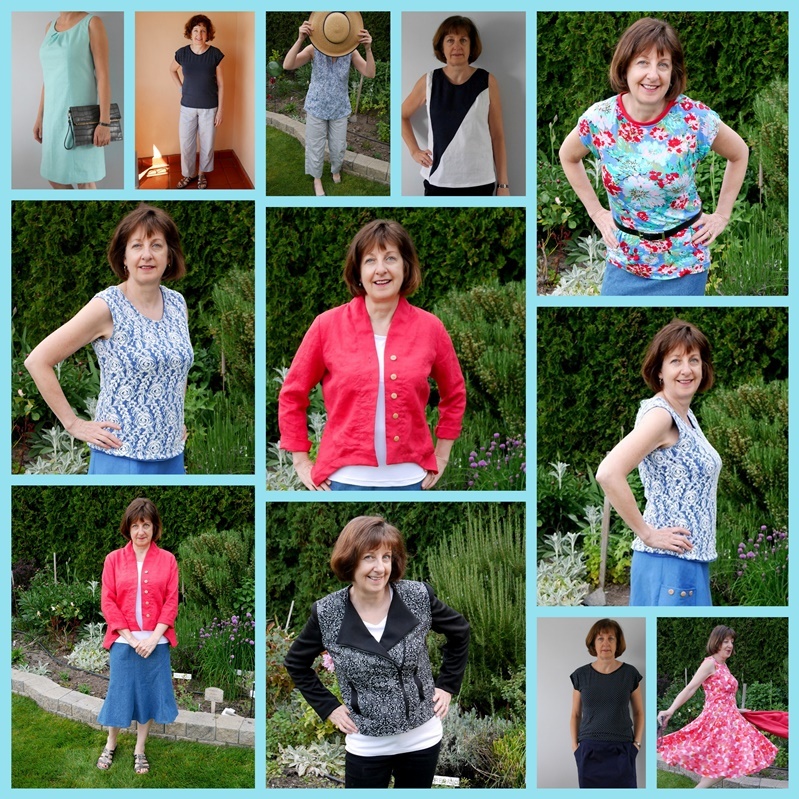 In the end, though, I counted up what I'd sewn - 21 items, including a couple of jackets, a cardigan, several t-shirts, a couple of skirts, blouses and dresses. Not bad. The collage shows some of what I've sewn. I get awfully tired of posing for photos and seeing so much of myself. When I gave myself the challenge, I had no idea that I'd be working so much. I felt like a bit of a failure having to purchase clothing, but when I sat back and took a look at my life, I gave myself permission to change things up. Circumstances change so expectations of what can be accomplished have to change, too. And in the end, I'm pleased with most of what I've sewn. Just one real wadder. Have I challenged myself the same thing this year? Nope. I'm still teaching. But I'm continuing to sew slowly, when I have the energy and focus. It's something to enjoy, not a duty to perform. Have you had to adjust expectations recently? Any challenges you've set yourself? Some wonderful makes, well done. Life for me changes on a regular basis as I care for my parents and husband, I adapt to their needs as I go along. It seems to work for now. Best wishes for 2016. What an accomplishment! You should be well pleased with what you did. I love them all, especially the dress you're twirling in! The challenge I've set for myself in 2016 is to de-clutter, an ongoing struggle but one I'm serious about this year. Love this challenge and I also love that you kept your challenge under your hat until you had achieved your goal. What a great wardrobe too! You must be so proud. Whoohoo! Excellent, Lorrie. And to do that while you were working. I don't know if it's much cheaper anymore to sew like it used to be, but certainly you know the garment is well made with good fabric. Yes we all need to learn to forgive ourselves a bit and add flexibility to our persona. You're amazing! Wow! That's such a huge accomplishment! Oh, I love that mint dress! You have created such beautiful items for your wardrobe. I can sew only simple things, but I hope to improve this year. I gifted myself with a sewing magazine subscription. :) It's very inspiring - and very helpful for a beginner. Oh Lorrie, your wardrobe is beautiful! Indeed, what an incredibly accomplishment! I bought fabric a year ago to make a skirt and guess what? It's still sitting in my craft room waiting to be used :) You are simply lovely, sweet Lorrie. Wow! Twenty one makes is amazing! You look great in the photo shoots, especially in the twirly skirt ;) I stopped sewing for myself because things weren't fitting properly and it was becoming a waste. I would make something, and end up putting it in the goodwill bag. Not very cost effective! You are inspiration to try again though. You made some lovely garments, Lorrie...how you fitted it all in I don't know! Wow! What a lot of great clothes. I especially like the photo on the lower left of your collage. As for expectations? I reset daily. I am most impressed by your sewing skills. What a lovely wardrobe you have created. Pulling them all together in this collage seems a nice way to recognize and appreciate your accomplishments. Beautiful Passion Rose. Mine are popping up out of the ground already here! You really made some very nice items for your wardrobe. That's a great talent to have! As someone with no skill with the thread and needle, I salute you for sewing 21 items of clothing, Lorrie! I totally agree that we need to give ourselves permission to change up the rules when things don't go as expected (the sewing police won't arrest you for purchasing some clothing!). I love your wardrobe. WOW - you sewed those! Excellent job! Sewing is not my strength but I'd love to start again. I think one of my challenges is to dress myself up as well as I dress up my home. I think you have done a wonderful job and your clothes are just adorable. Good for you. Very impressive! Both how great you look in your clothes AND that you could manage this much sewing while living such a busy life! Also impressive that you have the wisdom and maturity to cut yourself some slack when necessary while still recognising what you've accomplished. Well done! Well I say you did a fantastic job with all that sewing and you look very cute in it. My favorite has to be that blouse near the right with the pretty colored flowers. Wow!! Whether you strictly met the goal that you set or not, just think of all that you accomplished! You created some beautiful things! I think my favorite is the pink (or is in melon? coral?) jacket, but they are all so pretty. Life is all about making adjustments, isn't it? All your creations are lovely and look very pretty on you! Your 'take' on taking on a new project, like your sewing, is wonderfully refreshing, that it is 'something to enjoy, not a duty to perform'. And how right you are about focus and energy - throw in absence of time limits, and voilà(! ), you have the making of a masterpiece! Congratulations on pretty well accomplishing your goal! I enjoy seeing you model. With no sewing to the rescue for me, I wonder what the challenge not to purchase any clothing would be like? It would be hard. Well, so far so good. =) Ha! You look beautiful, Lorrie, in all your homemade wardrobe! What an accomplishment and you should be so proud of yourself. Good for you! Cute clothes too! I'm also happy that you didn't hold yourself to something that just didn't work out.